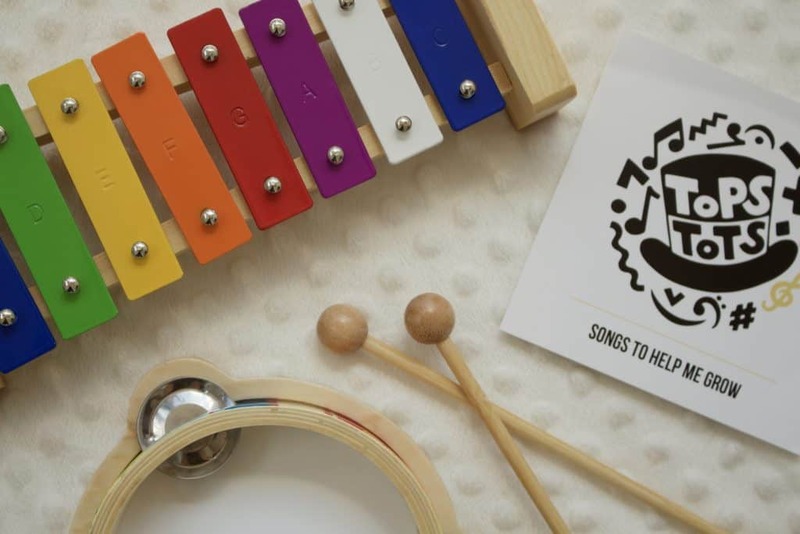 An introduction to Tops Tots, an educational music program for music-loving families with toddlers, and their first album, Songs to Help Me Grow. We listen to music throughout the day every day. Music always plays in the background during breakfast and lunch, and it’s not uncommon for my toddler to wave her hands to request songs at other times too, especially when we’re in the car! We sing, we dance, we listen. But sometimes we’re simply hearing the same things over and over again. I love finding new artists and albums to add to our playlist, but I don’t always make it a priority. Top Tots debut album, Songs to Help Me Grow, includes ten catchy songs that we’ve been enjoying on car rides and during toddler dance parties. (We all have toddler dance parties these days, right? It’s my favorite kind of dance party because twirling is major element. I’ve only ever liked dancing if it involves a good twirl.) I try to expose my daughter to lots of different types of music, but there are a few children’s albums we especially love. I’m adding Songs to Help Me Grow to my short list because it addresses lots of things we’re already working on together, like how to count to ten and memorizing the ABCs. The first song, “Hello Around the World”, pairs beautifully with this It’s A Small World board book that we already owned. The songs are short, so you’ll learn them quickly. My daughter likes to sing “Socks and Shoes” when she’s putting on her shoes. I appreciate “These Are My ABCs” for giving me an alternative to the traditional alphabet song (though I happily sing the classic song many times every day). It’s a short, upbeat album with educational value. These ten songs cover many topics that are pertinent to toddlers and preschool. These songs are about things and places young children encounter every day, such as words they are learning to say in “Words”, body part recognition in “All the Body Parts I Know”, having fun at the playground, and more. As I mentioned before, I love the counting and alphabet songs because they provide another way to reinforce these important concepts we’re already talking about throughout the day. You can stream Songs to Help Me Grow on Spotify and on Apple Music, or check out the Top Tots YouTube page. My daughter is our creative child and would love this cd. Thanks for sharing – I need to look into this for her! I wonder if my 5 year old would like this. Then maybe I could get a break from 24/7 Kidz Bop! What a fun idea! We love music too! I’ll definitely have to check this out! My daughter loves music too. Oh my daughter would have loved this when she was little! We have music playing in our house all the time too.